Employment Rate: Percent of the working-age population that is employed. Labor Force Participation Rate: Percent of the working-age population that is employed or actively looking for work. Unemployment Rate: Percent of the labor force that is without work and is actively looking for work. This decade started at a high point for the U.S. labor market. The lengthy economic expansion in the 1990s drove unemployment rates to 30-year lows for Hispanics (less than 6%) as well as non-Hispanics (less than 4%). The employment rate, or the percent of the population 16 and older that was employed, also peaked. As measured by the labor force participation rate, a higher proportion of Latinos and non-Latinos were active in the labor market, either employed or seeking work, than ever before. The unemployment rate for Latinos stood at 6.5% in the first quarter of 2008, seasonally adjusted. That was almost two percentage points higher than the 4.7% seasonally adjusted rate for non-Hispanics (Figure 1). As recently as the fourth quarter of 2006, only 0.5 percentage points separated the Hispanic unemployment rate of 4.9% and the non-Hispanic unemployment rate of 4.4%. That gap was the smallest since 1973, when employment data for Latinos first became available. The last time the Latino unemployment rate reached 6.5% was in the fourth quarter of 2004. Thus, the progress made by Latino workers in 2005 and 2006, as registered in the unemployment rate falling from 6.5% to 4.9%, was erased in 2007. The present rate of unemployment is also the rate that existed in the midst of the 2001 recession. 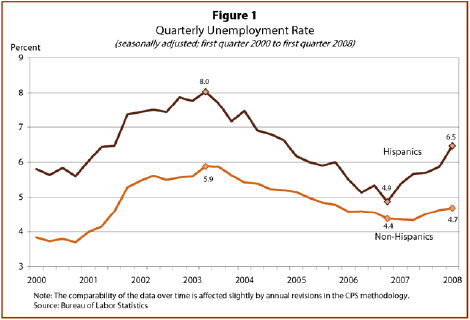 However, the Latino unemployment rate today is below the peak rate of 8.0% in the second quarter of 2003. The increase in the non-Hispanic unemployment rate during the current slowdown has been more modest. Non-Hispanic unemployment dipped below 4.0% in 2000 but then climbed to 5.9% in the second quarter of 2003. That peak was followed by a steady decline and the non-Hispanic unemployment rate dropped to 4.3% by the second quarter of 2007. Since then, it has increased modestly to 4.7%, or 1.8 percentage points below the Hispanic rate. An unemployment rate gap of that magnitude was last observed in the first quarter of 2004. The employment rate is the percent of the population 16 and older that is employed. As an indicator of labor market conditions, it is considered a valuable alternative to the unemployment rate. That is because the unemployment rate can often move in unexpected directions. For example, the unemployment rate can increase during economic expansions as more workers are drawn into the labor market to seek work. Conversely, the unemployment rate can decrease during an economic slowdown if enough workers drop out of the labor market. The employment rate is not subject to that type of counterintuitive behavior. The Hispanic employment rate has fallen over the past year. 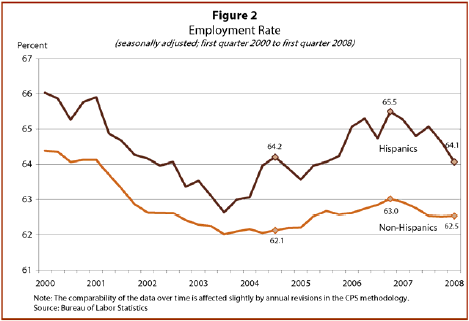 The seasonally adjusted employment rate for Hispanics in the first quarter of 2008 was 64.1% (Figure 2). That is comparable to the employment rates in 2004 and 2005 but well below its most recent peak of 65.5% in the fourth quarter of 2006. The current employment rate is also significantly below the pre-recession level of 66.0% in the first quarter of 2000. The seasonally adjusted employment rate for non-Hispanics also declined, to 62.5%, in the first quarter of 2008. That, too, was below its last peak of 63.0% in the fourth quarter of 2006 and much less than its pre-recession level of 64.4% in the first quarter of 2000. The latest decrease in the employment rate has been greater for Hispanics. In the fourth quarter of 2006, the gap in the employment rates was 2.5 percentage points in favor of Latinos compared with non-Hispanics. Since that time the gap has shrunk to 1.6 percentage points in favor of Hispanics. The shrinking gap in the employment rate is consistent with the increasing gap in the unemployment rate noted above. The labor force participation rate—the percent of the working-age population (16 and older) that is employed or actively seeking work—changed the least in recent years. A steady labor force participation rate indicates that the labor force is changing at the same pace as the working age population. In other words, workers are neither leaving nor entering the labor market at a different rate than before. 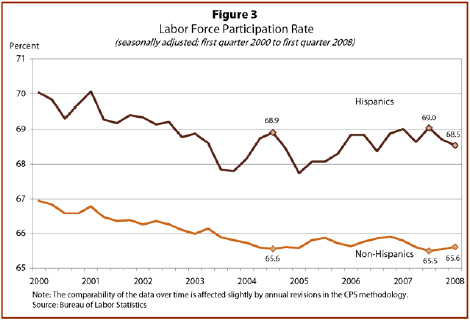 The Hispanic labor force participation rate in the first quarter of 2008 was 68.5%, on a seasonally adjusted basis. That was slightly below its latest peak of 69.0% in the third quarter of 2007 (Figure 3). Overall, labor force participation among Latinos is comparable to recent years as, with few exceptions, the rate has fluctuated between 68.0% and 69.0% since 2003. Like Latinos, non-Latinos have maintained a fairly constant labor force participation rate since 2003. The non-Hispanic labor force participation rate has been stable at about 65.6% since the second quarter of 2007. The steady course on labor force participation, for both Latinos and non-Latinos, is a clear indication that workers are not leaving the labor market despite the latest economic slowdown. It is also worth noting that the recent increases in unemployment rates, especially among Latinos, would have been lessened if workers had decided to leave the labor market. That is because workers not actively seeking employment are not counted as unemployed.